With the increase of popularity of the roulette game it has become associated with a variety of myths that make inexperienced players victims of their own credulity. Here is the list of most popular myths roulette casino game is associated with. All roulette wheels are basically the same. It is not true. 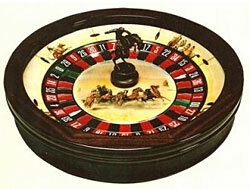 The player can always choose between European and American roulette wheel. The American wheel has 38 numbered pockets comprising numbers from 1 to 36 and two zeros - '0' and '00' - which makes house advantage over the players higher - about 5.26%. At the same time, European roulette wheel has only one zero on it, which reduces house edge to about 2.7%. This way it offers players better odds. The results of the spin are not random. According to this myth, the player has to analyze the previous games' results to note coincidences and make his or her bet respectively. For example, if the ball has hit Black for several times in a row, you must bet on Red. This is also connected with a rule of 'sleeping numbers', when the players bet on numbers that have not come out for long. In fact, the roulette wheel spins ARE random. The chances your number comes out are always 50%, and there can be no history of spins worth noting. Mathematical systems can help you win in the roulette. As it is impossible to trace the history of the roulette wheel spins, it is also impossible to apply any mathematical system to the game of roulette. How can one carry out analysis if there are no reliable data? Besides, as roulette is a game of chance, applying any systems to it contradict to the very nature of it. Another popular myth is concerned with money management. The fact is that no money managing can reduce the house edge. That is why the casino will always have the advantage over players. Money management is useful, of course, as it helps the player preserve their funds, but in no way does it help to win the game. The dealer can affect the landing of the ball. Again, this is false. No dealer, even the most experienced one, can make the ball land in an exact slot. The fact is the ball's movement is random as it spins against the spin of the wheel at a great speed and meets different bars on its way that makes it impossible for the dealer to control it. There is no difference between bets. This is very untrue. One of course can bet on any random single number on the layout and win by a mere chance. But these chances are so small that the recommendation of most roulette game guides is to make outside bets rather than inside ones, especially Straight (bets made on a single number). Even money bets like ones on Odd/Even or Black/Red give the player 50% chance to double his or her money.